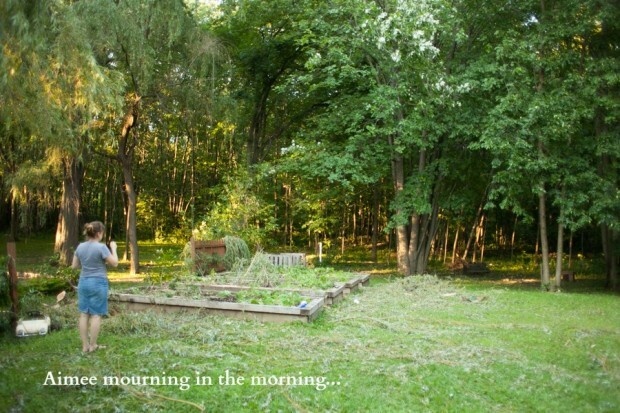 Editors note: I asked Danny to share about our July garden disaster in his frank, factual way. I haven’t written about it previously because, well honestly, I was too upset. 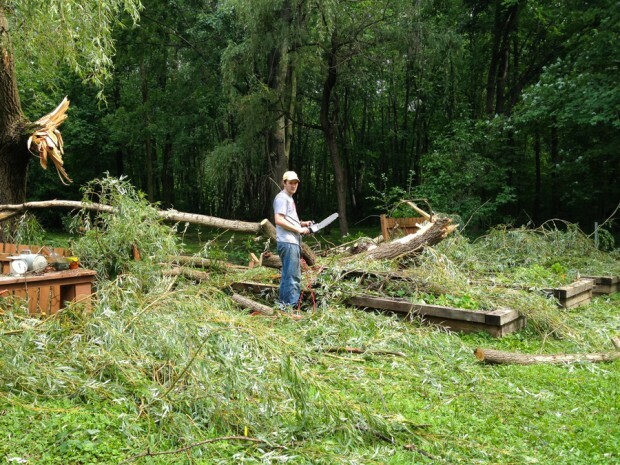 If you’ve been through a major storm, one that has wreaked havoc on your homestead, then you’ll understand why. I‘m one of those people who love storms. I guess I’m both awed and impressed by the sheer power that they unleash, whether it be a rain storm, thunderstorm, blizzard or hail. I’ve never really thought of them as dangerous, because we watch from the comfort of our home, and get candles and stuff like that ready, “just in case” we lose power. But last month, we had a very intense wind/rain storm that reminded me that there is indeed an element of danger and they are no laughing matter. From Aimee’s various Instagram pics and Facebook updates, regular readers will know that our neighbor’s large tree crashed through the fence and landed pretty much square on our garden. Here is the story. Back at the office, I had a few coworkers look at me with bewilderment, as I was becoming increasingly agitated during my phone call, looking out the window (nothing unusual to see), and trying to calm my wife down. I calmly told them I would be heading out sooner than later, and that we might lose power. Almost on cue, the lights went out and we could now see horizontal wind whipping through the streets. A FedEX truck was stopped on the street with flashers on. Trees were bending to unnatural shapes. A stop sign was permanently bent to 45 degrees – and I watched it happen. And then I remembered that I had cracked my car window a little bit because it was stinking hot outside. Crap. On the windward side too. Looking at weather trends later that weekend (because that’s what I do! ), it had cooled from around 90F to 71F within one hour, which is a massive temperature drop. I waited until the wind abated somewhat, hopped in the car, and started driving, figuring that traffic jams were sure to come (they were), and that I wanted to be with my family. I didn’t really see much damage until I got closer to home, where I had to drive under or around several damaged or fallen trees (one was held about 10 feet off the ground by a stretched power line!) as well as garbage and other yard debris littering people’s yards. Aimée was convinced that the entire garden was toast, but I tried my best to reassure her that nature is resilient and that we’d have to wait until we returned from vacation to make any final diagnosis. Pretty much all our tall plants were gone (beans, peas, tomatoes), but we had a surprise with a vibrant cucumber plant in the worst-hit bed. Surprisingly, that’s about all that died. The rest of the garden has flourished, and we should get a great crop of carrots, potatoes, and mint of course (it’s pretty hard to get rid of mint once you have it – even if a tree falls on it). The chickens were on the other side of the lawn that day, and are still doing just fine. Our neighbor has a mini-tractor, and on the Monday was rolling these huge logs out to the forest to rot, and I said that I would love to have them and that I’d “figure out” what to do with them. It’s a decision I hope I don’t regret. They’re about 3-foot diameter and about 5-6 feet long each, and they’ve already started sprouting. Crazy tree! We also have a few smaller curved ones that wrap around the firepit for seats. How scary! So glad that it was fine in the end (sans tomatoes and beans) and that nobody was hurt. That’s all that really matters! It really has come back quite nicely and we’re all fine. Thanks for your comment! On a positive note: it looks like you’ll have great sun with that tree gone. She was a beauty, but maybe it’s a blessing? You may find next years harvest makes up for this year’s losses. I assume you folks know those willow logs, branches, etc., will all grow (even if planted upside down!)? If you want another willow, that’s a good thing. :*) If benches are preferred you will need to kill those suckers!! I LOVE our willows, but they sure can be a pain sometimes. Not a long-lived tree here in No. Calif. I’m planting a RED OAK when then next one goes down. 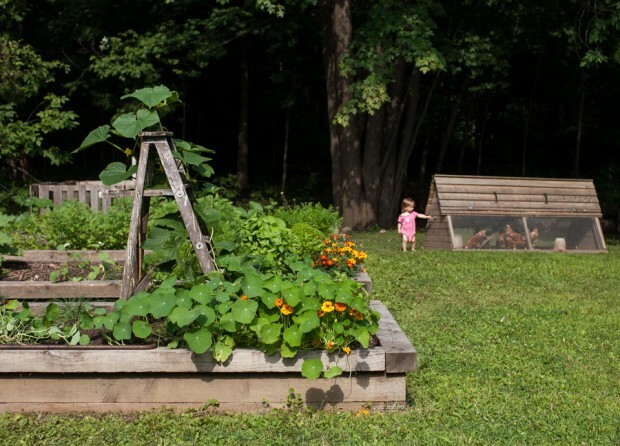 Your garden is going to be AMAZING next year with all that sun…Happy gardening! Our neighbour plants them by cutting a live branch and shoving them in the ground. I guess I should have known, and will definitely be trimming those green shoots to give us more options. I don’t know whether it is the additional sun, or the “wake up call” to be productive, but the garden is doing great. I was going to say the same thing – blessing in disguise. 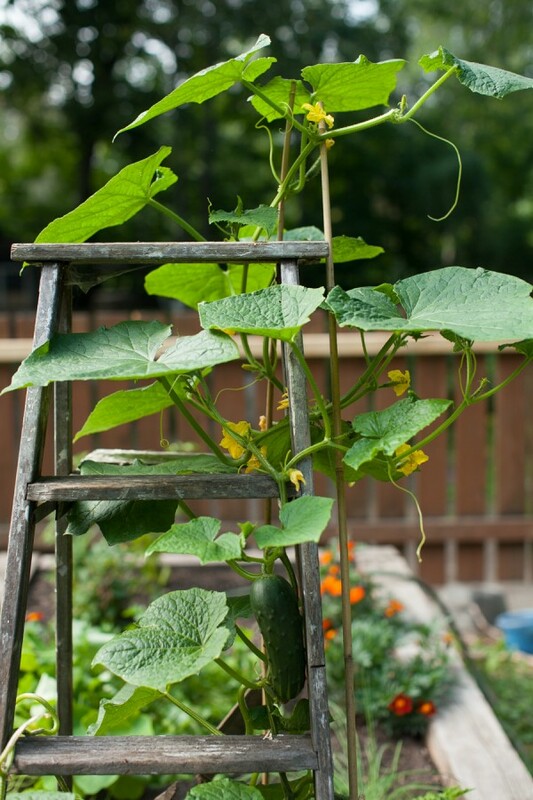 Maybe you’ll get even more sun for better vegetables. 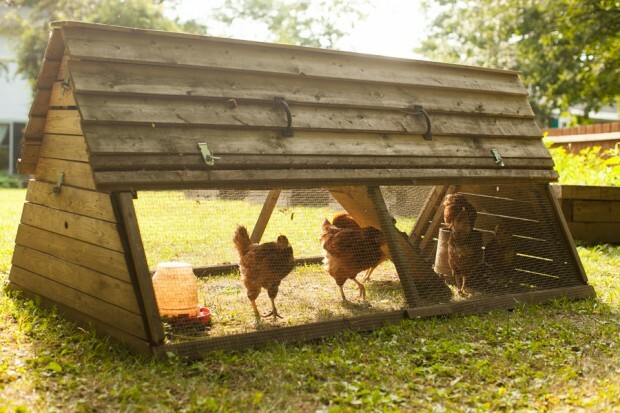 And good thing the chickens weren’t there. We have huge willows on our property and I’m really glad they’re far from the house in case they fall. Storms are getting pretty severe here. Willows have weak wood! And let’s hope that the squirrels don’t eat it! We definitely have more sun and are excited for next year’s crop! We have indeed been through this twice at our house in New Jersey. We live on the edge of a forest, just like you guys. With Hurricane Irene, a tree came down from the forest directly across our retaining wall, driveway, and most specifically, my car. “BFT”, as we dubbed it (it weighed about 4 tons – I’ll let you figure out what the letters stand for) blocked our front door and driveway for about a week. We had to leave our house via the back door and walk through the forest, down the hill, to our neighbor’s house and yard. As you can imagine, we moved to a hotel pretty quickly until we had free access to the front door. 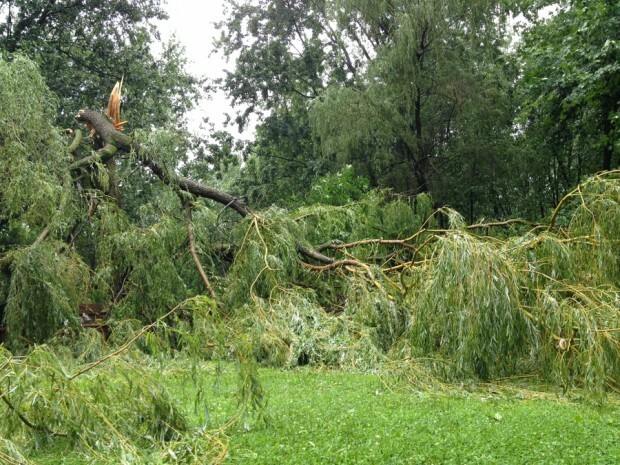 My heart hurt to see the willow come down, but I’m so very happy to see that the majority of the garden survived. Like all good husbands, Danny, you are the ying to Aimee’s yang, being the calming force when she needed it most. I’m so glad she has you. Thanks for the morning laugh. I know you and James, and I know exactly what ‘BFT’ stands for. 😉 That’s a pretty accurate description of our willow, too. Amber, I remember you telling us about it (or maybe I heard it from Aimee), and I was kinda “meh, it’s just a tree” about the story. 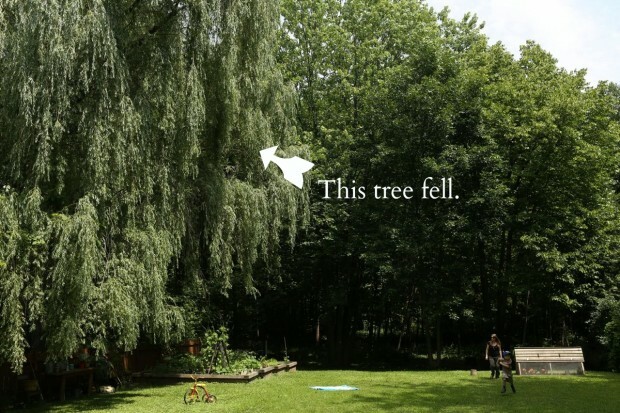 Let’s just say I have a whole new appreciation for falling tree stories. we used to live in New Orleans and we evacuated for Hurricane Katrina. So I know the destruction any storm can make. We came home to a wind and rain damaged home and knew we’d be busy for a long time with the repairs. Wind took off part of the roof and rain caused damage with wet drywall and soaked carpets. This is the normal, typical hurricane damage! Others had to contend with flooding and losing all their possessions. Contrary to my previous comment to Amber about my “meh-ness” to falling trees, I was aghast at the devastation of Katrina to your old hometown. We were blessed to have such trivial damage. Despite all the comments about more sun to our garden, it really WAS a beautiful tree, and we’ll miss it. Yes, we have had ALL our tall corn blown down in a warm wind the past 2 years. Those logs I’d set upright in my flower garden and put birdhouses on. But I love birdhouses! Thank you, Danny, for the update, and the pictures. I know when it first happened I was one on Twitter who said “Thankfully no one was hurt.” Insufficient words. 140 characters is so insufficient. Of course good that no one was injured, but it was also clearly heartbreaking and horrifying and seemed just too terrible in the moment. I’m looking forward to hearing about how you move forward, planning how to use your now sunnier space. Hot peppers? We’re not really hot pepper kind of people, although we may try tomatoes again with the additional sun we’ll be getting. We had one of those 100 year storms last year here in Colorado. It hailed golf ball size hail for an hour and a half. I had never seen anything like it and it just seemed to go on and on. They had to bring out snow plows to clear the roads. Needless to say it destroyed every plant in our garden and yard. We have two apple trees that were almost completely denuded of leaves. Our garden was a graveyard of sticks that used to be tomato plants. Even our front yard looked like a muddy mess where the grass was beat beyond recognition. I was so depressed my friends and family brought me vegetable plants for the next few weeks to replace some of what was lost. It was a sad sad year in our house. Yikes! I’m sorry you guys had it so bad. Oh no! I’m so sorry that you had to experience the broomstick end of mother nature. We’ve had a pretty lucky growing season here just south of Edmonton but to the North and South of us it has been nothing but storms and crazy flooding. I’m working extra hard on my canning in case the tides reverse next year. Great link about hugelkultur. I guess we kinda did that with all the smaller branches, but haven’t covered them with dirt, just turned it into our leaf pile. 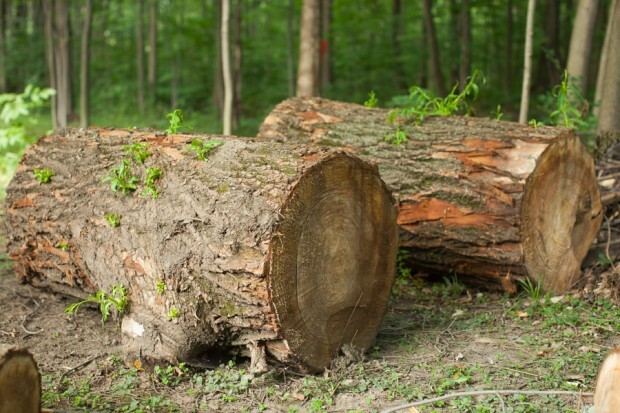 The logs we have are short but massive. Not sure where we’d put that kind of feature hill on our lot. We had one here that left us without power for five days. There were power lines down and trees 3′ in diameter completely uprooted in yards. It definitely gives you respect for the power of nature to both destroy and come back green as ever. Shaina, I have more respect for nature than ever. I went from being a “cool, I wish WE had a storm so I could stand outside in the wind and feel it on my face” to a “I should probably build a bunker in my back yard…just in case”. Don’t I know it about the mint. 😉 What a resilient garden (and family) you have – I’m so glad you were able to salvage the garden and now have some cool logs to play with. Any chance you can plane them down and build new beds or a garden shed? If I could plane them down and have nice massive planks (without the sprouts on them), then I just might consider it for our shed. We do have more sun, but my neighbour has given up gardening because… his lot doesn’t have enough sun from all his trees, so he has no tomatoes to give. Fixing the fence more than made up for it. Seeing those made me think that one could also create a lovely rustic cake stand with a slice of bark-trimmed wood. I wish I had the skills (and a fallen tree) to try making something myself. “Bon chance” to you! I’ve definitely thought about making disks out of the logs and using them as patio tiles or for a walkway, but they’re so big!!! Oh, that is really sad to read about but I’m glad you didn’t lose everything and that you had Nova Scotia to help heal the pain. I didn’t think a bit about our garden or fence when in NS. It was amazing. This Calif. girl was home alone with our 3 month old son in Il. when a tornado swept through. The rain was hitting the house side wise, coming into the house, and dripping out the light fixtures! I chased down the 3 cats and put them in a central bathroom along with my son & myself. Our tree came down on our house and the carport was moved off the foundation. When it was over, I called my husband at work 10 miles away and told him to rent a power saw on the way home because the tree was down. He didn’t believe me and drove home without stopping. He drove back to town to rent a power saw and they were all rented out by that time. So he had to chop the tree up by hand! Maybe next time he will listen to me……. I have 2 bucksaws, and figured that I would be able to do a large portion with that, but there’s no denying the speed or power of a chainsaw. and maybe carve out a few (no idea how) to make seats. I definitely have a vision for a walkway. Growing up on the Texas coast I’ve seen my share of strong storms, tropical disturbances and hurricanes. Hurricane Ike (CAT4) made a direct hit where my parents live. Ike took down an ancient oak (like 100 years old) as if it were a twig. My dad was home and said the ground shook like mad and he thought the house was a goner. One of the only times he admitted 1. Maybe he made a mistake not evacuating. 2. He was actually scared when the tree hit. It was sad going back home and seeing all the trees fallen or stripped of there branches. For years they looked like sad sticks standing at attention. Mother Nature can be a force of fury but the land is resilient and will heal itself. It just needs time. Glad everyone was safe though! The “twigs and sticks” description you give for dead trees reminds me of much of Northern Ontario when driving above Lake Superior. I don’t know whether they had had fires, or disease, or pine beetles, but it was a depressing landscape. I feel for you. In June we had a bad storm hit our urban Minneapolis neighborhood and our neighbors tree 42 inches in diameter fell right on our house. The tree was removed quickly and house is getting fixed but the yard, fences and gardens are hard to enjoy during these summer months when it still feels trashed. My husband kept three huge logs too and I’m wondering how long they will sit before creativity strikes. I’ll race your husband. =) Creativity is there, but the time and tools to implement is not.